Australia is the most sought-after destination for highly skilled professionals who wish to start a fresh life abroad. With a vibrant economy and booming industrial sectors, Australia is offering greater opportunities for skilled immigrants. Every year Australia welcomes a good number of skilled immigrants who can contribute to the growth of the economy. To encourage skilled immigration, the Australian government has designed many schemes of which Australia Skilled Nominated visa (subclass 190) has received greater response among skilled immigrants. What is Australia Skilled Nominated visa? Australia Skilled Nominated visa is for skilled professionals who qualify in a points based system and are nominated by a state or territory government agency. 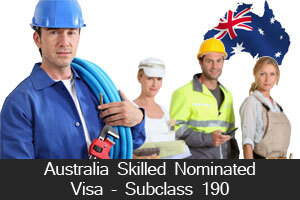 Australia subclass 190 visa permits you to reside and work in Australia as a permanent resident. To apply for Australia subclass 190 visa, applicants need to submit an expression of interest and then be invited through SkillSelect. Applicants can be either inside or outside of Australia at the time of applying or issuance. Express of Interest is a process of demonstrating your interest in applying for a skilled visa to immigrate to Australia. In an expression of interest, you need to answer set of questions, which defines your skills and abilities to migrate to Australia. SkillSelect is an online service that assists the country to manage its skilled migration programs. The service helps Australia to address regional skill shortages and allows prospective immigrants to demonstrate that they are interested in residing and working in regional Australia. Who qualifies for Australia Skilled Nominated visa? So, apply for Australia Skilled Nominated Visa to take the advantages of Australia immigration. I have completed Hospitality management from Melbourne (Australia) and wants to go back.. I am a mechanical engineering student of 6th semester,i want the immigration of australia.